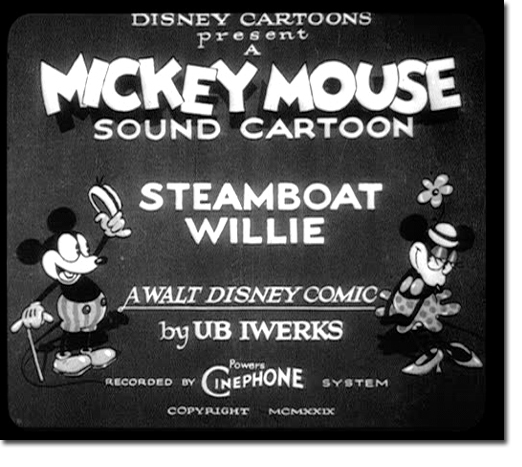 It’s a challenge to top the charms of Steamboat Willie, the animated Disney short released on November 18, 1928. It was the first cartoon to feature synchronized sound and all these years later I can still recall the plot. 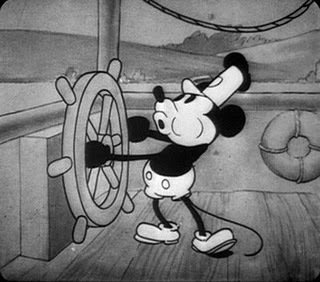 Mickey is aboard the eponymous steamboat, captained by Peg-Leg Pete, who flies into a fit at the sight of a Mickey whistling and turning the wheel as if he’s in charge. Later, collecting cargo, an emaciated cow has to be force-fed hay before being hoisted on board. 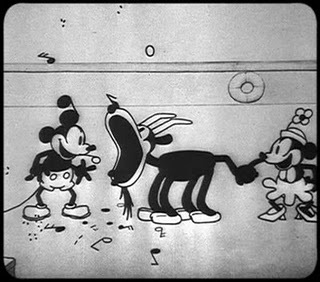 Then there’s Minnie who just barely makes it onto the boat with Mickey’s help; when a goat eats the sheet music she’s been carrying, the pair crank its tail to have all the notes comes out. 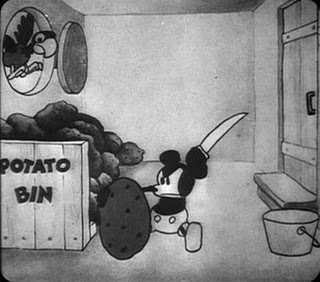 My most memorable image from the caper comes in the form of our hero sitting on the deck surrounded by a huge pile of potatoes to peel. A parrot starts laughing at the unfortunate Mickey, so he lobs a spud right at him which sends him flying into the water. So this is Roy right out of the starting blocks in his first painting to use cartoon imagery. 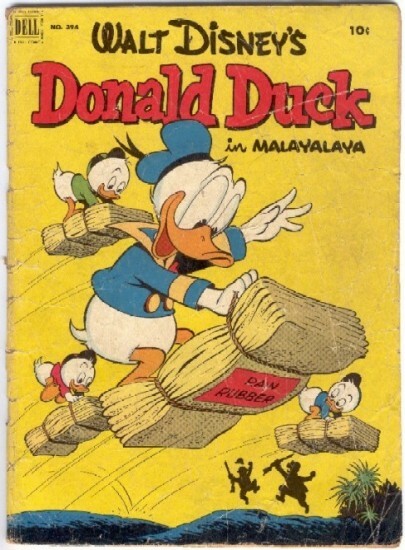 It delivers a comic image from the 1960 children’s book Donald Duck Lost and Found and shows how the artist adapted the image to fit the aesthetic he was evolving: outlines are emphasized, colors are saturated and the composition is simplified. So ultimately we end up with a painting that’s more “Popping” than the original comic. Cartoons and advertising remained the go-to inspiration stock for Lichtenstein as he set out to reflect popular culture in a flat and deadpan way. His images are magnified, his colors strong and simple, his forms are flattened and often (though not here) Benday dots abound. All to emulate in an ironic way the appearance of mass-produced printing processes. 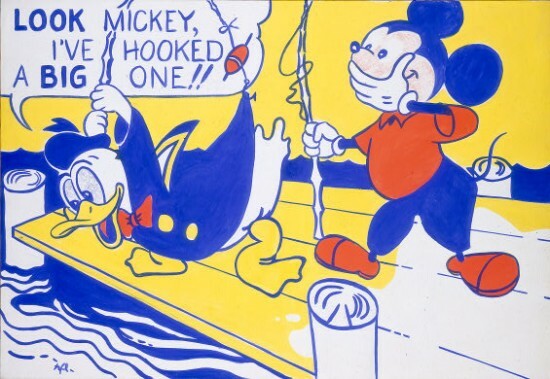 At the time, Lichtenstein’s Pop Art – with its simplistic narratives and bold graphic visual language – was understood as a stand against the powerful postwar legacy of Abstract Expressionism. But let’s not load little Mickey with too much meaning for today. Instead let’s just enjoy him as a bright-colored break in a busy day. But Aleid, after meeting you at your delightful Hump Party past summer, I would not have assumed you are 90 years old and originally saw Steamboat Willie, back in 1928, when it was first issued. 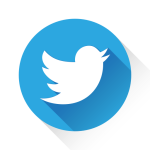 You write with the authority [“all these years later I can still recall the plot.”] and immediacy of one who was there at the creation.